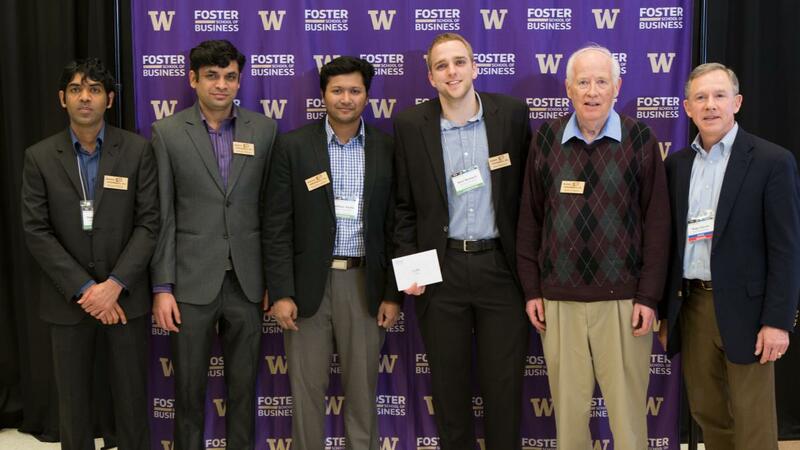 ChemE teams excelled at last week's Alaska Airlines Environmental Innovation Challenge. The event awarded a total of $37,500 to student innovators. Ionic Windows with Greg Newbloom, Anthony Moretti and Ian Hochstein (advisor Prof. Lilo Pozzo) won the $10,000 Second Place Prize and the Clean Energy Prize of $5,000. Ionic Windows provides low-cost, high-performance membranes for emerging grid-scale energy storage technologies. "We are very excited about the 2nd place finish and Clean Energy Prize at EIC. We are even more excited about our technology, which will help to sustainably reduce the capital costs of flow batteries for grid-scale energy storage," said Greg Newbloom. Battery Informatics with Manan Pathak, Matt Murbach, Uttara Sahaym and Mushfiqur Sarker (advisor Prof. Venkat Subramanian) received one of the $1,000 "Judges Also Really Liked" awards. Their mission is to become a leader in providing systems for optimal operation of Lithium-ion batteries for electric grids and commercial buildings. Decaf Style: Decaf On the Way to Go is currently developing new environmentally friendly materials that provide instant beverage decaffeination without affecting the taste. Smart Charger Pro offers customers a smarter way to charge their electronic devices; utilizing flexible charging rates powered by electrochemical model control, a longer life per charge and improved battery health can be achieved, to reduce battery waste and save energy. For the complete list of awards, visit the EIC blog post.